For fans of the sample editing and performance capabilities of Akai's MPC line of hardware workstations and the power and versatility of using Ableton Live paired with a Push controller, Akai has just announced a brand-new, standalone music workstation that might just catch your attention: the Force. If you spend enough time on music production forums, you'll be aware of users asking for an "Ableton-in-a-box," by which they mean a standalone device, with pads, that they can use to trigger samples, audio files, and beats like they can in Ableton Live, but without worrying about a computer. Now, it should be made clear that Akai and Ableton are two very distinct companies, and Akai is not claiming in anyway to have put "Ableton-in-a-box." But all the same, producers and DJs that have been wanting this functionality will be pleased to see this development. The Force allows you to load samples, edit them as you can on an MPC, and then use the 64 pads and the 7" touch-sensitive display to launch clips, play instruments, craft sequences, or manipulate samples. You can also choose to play on a classic 4x4 grid of pads for MPC-style finger-drumming as well. Additionally, eight touch-sensitive knobs with graphical OLED displays give you further control over any assignable parameter. You can also record and playback effects automation. Four synth engines—including one for leads, analog-style synths, basses, and electric pianos—as well as an expansive library of drum sounds also come included. Stems, one-shot samples, loops, and other audio files can be loaded through USB thumb drives or SD cards, and you can record audio direct into the Force through two XLR/line/instrument inputs (which include options for phantom power). There are MIDI in/out/thru ports, as well as four CV/Gate outs. The Force promises automatic BPM detection, as well as real-time time-stretching and pitch-shifting—allowing DJs to easily match audio of different tracks or producers to manipulate sounds and samples. There's also a crossfader where DJs can assign tracks, stems, or loops and easily mix between them. The new workstation comes with 16GB storage on board, with more than 10GB of sound content included. There's a full-size SD card slot, 2 USB 3.0 slots, and a user-expandable 2.5" SATA drive connector. For musicians looking to add live sampling to their sets, producers desiring to play their sonic creations on stage, or DJs looking for a standalone clip launching station, the Force appears to have plenty to provide. The Force will be available February 14. Check back soon to pre-order yours on Reverb today. 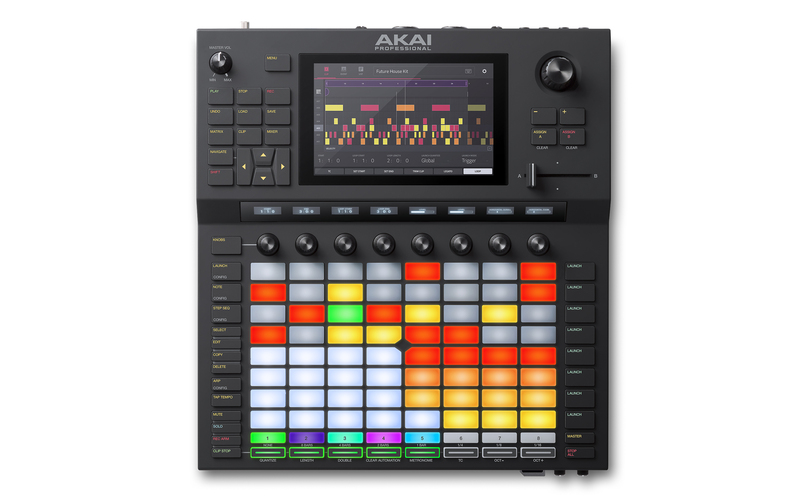 Additionally, earlier in the week, Akai announced a limited time promotion for the MPC X workstation. Now through April 14, new and existing users of the MPC X will receive a collection of premium sound content from the existing MPC Expansion collection and the all-new MPC Expansions Exchange, a value of more than $800, according to Akai. "From hard-hitting drums to sultry melodic lines and everything in between, this collection from leading sound designers builds on the existing critically acclaimed stock library, providing producers of all walks with the ultimate in must-have sound content for immediate creative inspiration," Akai says.